I embarked my corporate journey with Tata Consultancy Services. After a sufficient exposure to corporate I wanted to pursue MBA and the related opportunities, professional growth and various other factors dug this thought deeper and deeper. I initiated my preparation and started taking exams. Results and subsequent GD-PI-WAT process paved my path to this prestigious college- SYMBIOSIS INSTITUTE OF BUSINESS MANAGEMENT (PUNE). 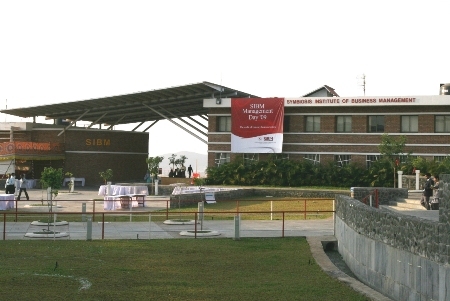 SIBM-PUNE falls under Symbiosis International University (SIU). SIU is a multi-institutional university located in Pune, Maharashtra. It was established in 1971 by Padmashree SB Majumdar and was given an autonomous status in year 2002 by ministry of human resource development. SIBM-Pune is the flagship Management College of Symbiosis University. It was established in 1978. It is among the premiere B-schools of India and it offers an excellent management course. Currently SIBM- Pune offers a fulltime MBA programme with specializations in Marketing, Finance, Operations and Human resources. Over the years since its inception SIBM has performed exceptionally well and it has been consistently among the top 14-17 Management Schools of India. These were the motivational factors that pushed me to prepare for SNAP another year and try to make it here. The good feeling started nurturing during the admission process itself where the whole process was handled by students. I was already glad about having waited for a year. The 15 days I spent here till now have been a great experience. The way the classes have been organized, the physical activities we have been made to do till date, the industrial visit, meeting so many new people and the best of it all, the campus itself on top of the hill, the only word describing all this is “amazing”. I’m looking forward to a great experience in the two years I’ll spend here. Joining SIBM, Pune – The Right Decision 5 out of 5 based on 1 ratings. 1 user reviews.